Managers from HISD Construction and Facilities Services showed their appreciation for the hard work of each team member on Friday and named the department’s 2015 Employees of the Year during the department’s annual appreciation luncheon and professional development day. This entry was posted in News and tagged CFS, Construction and Facilities Services on December 7, 2015 by HISD Communications. 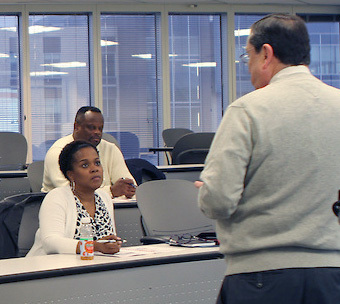 HISD’s Construction and Facility Services (CFS) Professional Development team recently announced the launch of a new Leadership Development Training initiative designed to dramatically improve the leadership skills of the management team. The program is developed and delivered by the Sales Excellence Institute at the University of Houston’s Bauer School of Business. This entry was posted in News and tagged CFS, Construction and Facilities Services on March 4, 2015 by HISD Communications. The Houston Independent School District Board of Education on Thursday voted to set aside $4 million for a comprehensive facilities assessment designed to identify buildings in need of repair or improvement. This entry was posted in Board of Education and tagged CFS on February 12, 2015 by . The Council of the Great City Schools has recognized HISD’s Transportation and Facilities Services departments as top performers in student transportation and facilities maintenance and operations. This entry was posted in News and tagged CFS on January 15, 2015 by . HISD Construction and Facility Services managers showed their gratitude for the hard work of each team member on Wednesday during the department’s annual appreciation luncheon. Employees were treated to a catered barbecue lunch served by managers and prizes, including gift cards and prize baskets, were handed out. This entry was posted in 2012 bond, 21st century schools, News and tagged 2012 bond, CFS on November 20, 2014 by HISD Communications. HISD Facilities and Operations employees received a warm welcome back to school on Friday, as they were treated to breakfast and special recognition by General Manager of Facility Services Brian Busby and HISD District 9 Trustee Wanda Adams. This entry was posted in 2012 bond and tagged 2012 bond, CFS, Construction and Facilities Services on August 25, 2014 by HISD Communications. Houston ISD’s Construction and Facilities Services Operations recently honored outstanding employees during three separate recognition ceremonies at the Delmar Field House. There are more than 1,200 custodians, plant operators and grounds crews who serve classroom needs and attend to building cleanliness on a daily basis. “I was asked to speak to the hardest working employees in HISD, and I want to thank all of you for your commitment to our schools,” said HISD Superintendent Dr. Terry Grier, as he opened the ceremonies. This entry was posted in Achievement/Recognition and tagged CFS, Construction and Facilities Services on June 7, 2013 by HISD Communications.